My name is Hannah, and I live in Germantown, TN. I am 19 years old and was diagnosed with Myotonic Muscular Dystrophy in 2014. My disease has mostly affected my internal muscles at this point and especially my breathing muscles and GI muscles. I have been blessed by being a local MDA ambassador and have had the opportunity to speak at businesses, organizations, and fire departments in the Memphis and Mid-South area to spread muscle disease awareness. I graduated from Westminster Academy in 2018, and Westminster Academy has joined me in the fight against muscle disease by joining my team, and they have had the honor to host the Memphis Muscle Walk for the past 2 years. Will you consider joining and/or donating to my Muscle Walk team? All donations remain local. (FYI - If you sign up to join the team, the minimum goal that you can set is $100 but this is a goal and NOT a commitment.) Thank you for being interested in finding a cure for muscle disease. 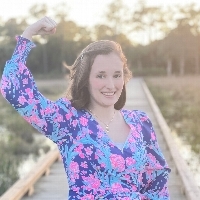 Please follow my Facebook page “Hannah’s Hope” and on Instagram “hannahshopeforacurefordm1” and message me if you would like more information about me, my muscle disease, our local MDA, or muscle disease in general. God bless you!